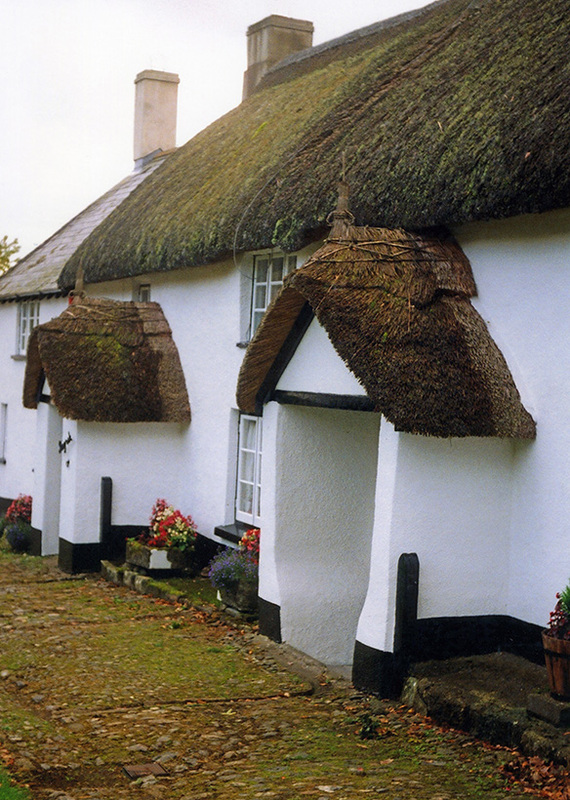 Thatched Porches and Walls… Small can be beautiful. Not all thatching work is carried out high above the ground. Some very attractive thatch lies just above head height… Helping disperse the rain from dripping eaves, and protecting some vulnerable structures. 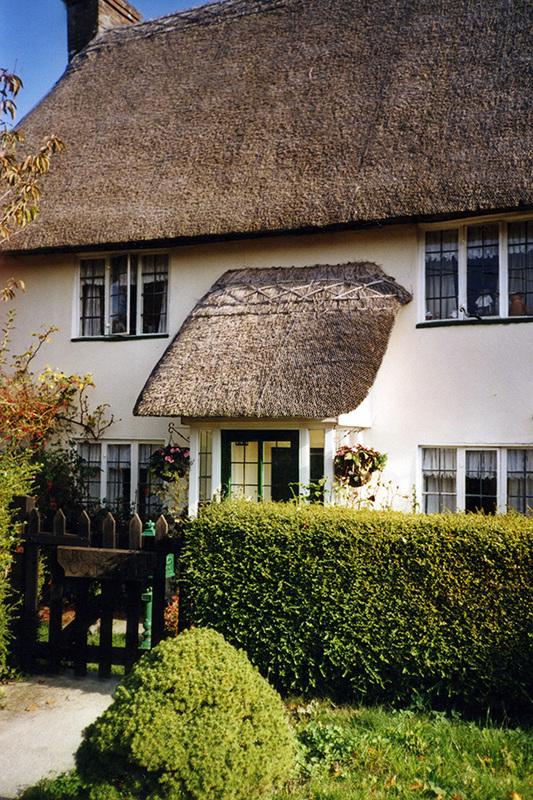 Porches & Walls… A correctly placed thatch porch can enhance most thatched buildings. 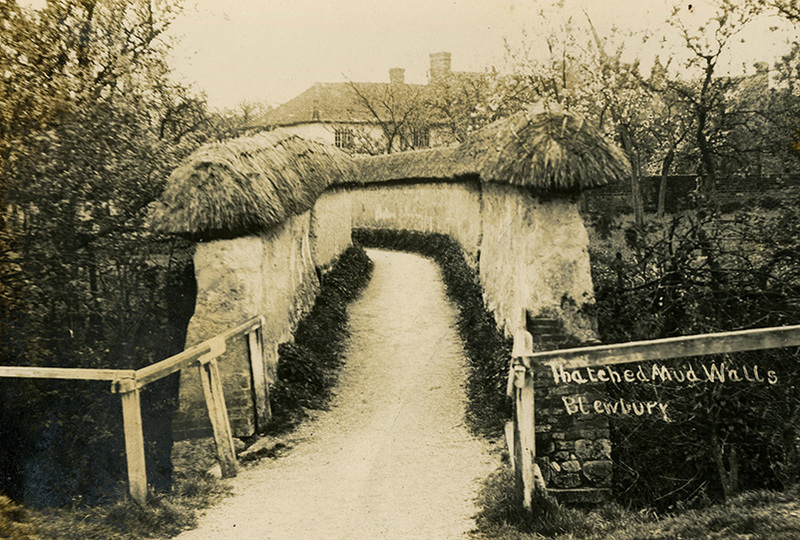 Keeping the occupants dry, as they fumble for the house keys, on a dark wet night… The old postcard above says it all… ‘Thatched Mud Walls’, or chalk cob, in this instance; protected with a topping of thatch. Like a house made of the same material, cob needs a ‘good hat and a dry pair of shoes.’ Thatch providing the top half of the equation. Or, the structure rapidly returns to the good earth, from which it came… These walls at Blewbury are still going strong, after nearly three centuries; as a more modern image will show. 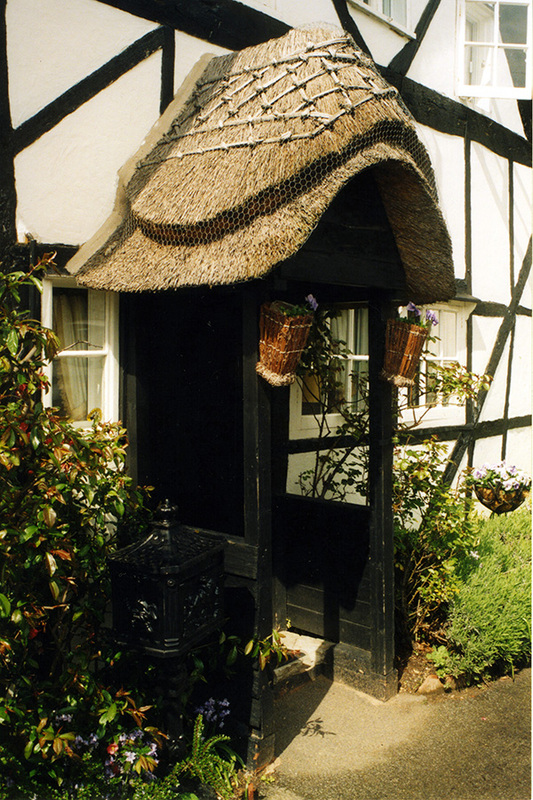 A well designed and positioned thatched porch, can be a useful and attractive addition to a thatched building. As there is normally no gutter, to carry the rain away, exterior doorways really need protection, from the dripping roof; by a porch. 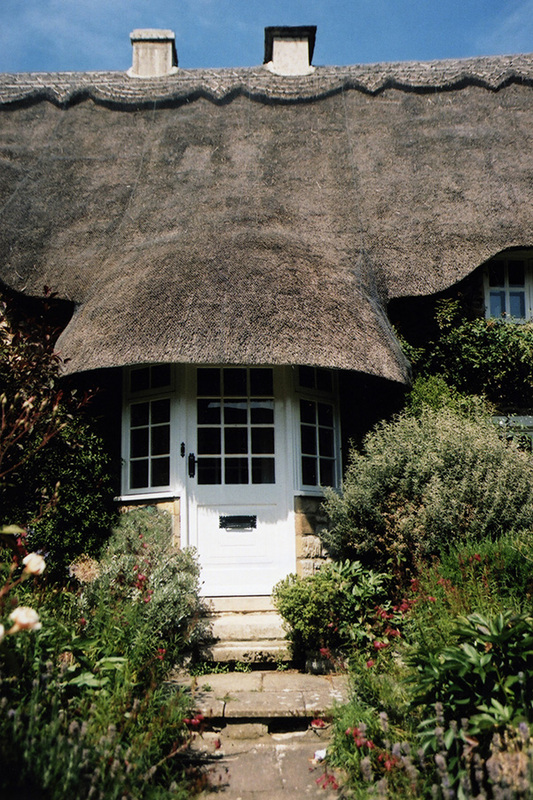 But when it comes to installing a thatched one, there are some basic rules to follow. In fact not every property can accommodate this feature successfully… Hopefully the following examples will act as a guide, for those contemplating such a structure. 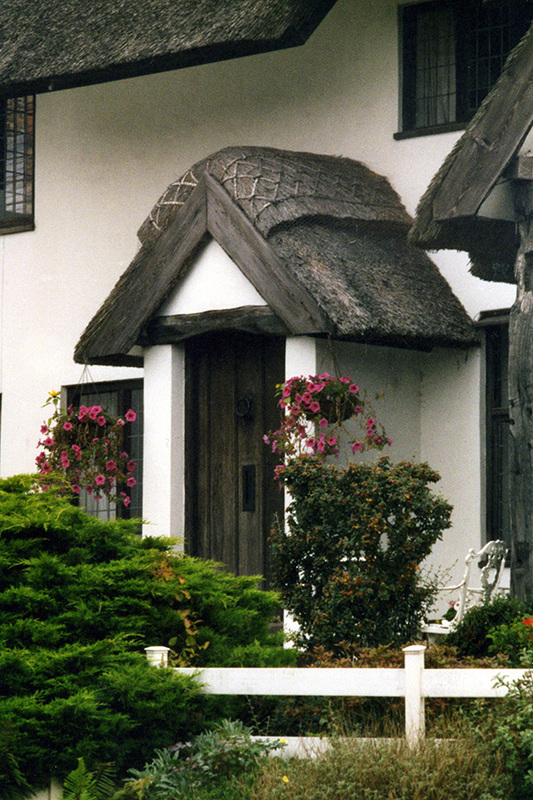 The basic requirement for all thatching, is a steeply pitched roof. This is especially important for a porch; which carries all the water from the roof above… If the design of the main building does not allow for a fully angled roof, then a problem will arise. The most common design fault, is when a first floor window is situated above the doorway, that requires a porch. If the distance between the two is insufficient. 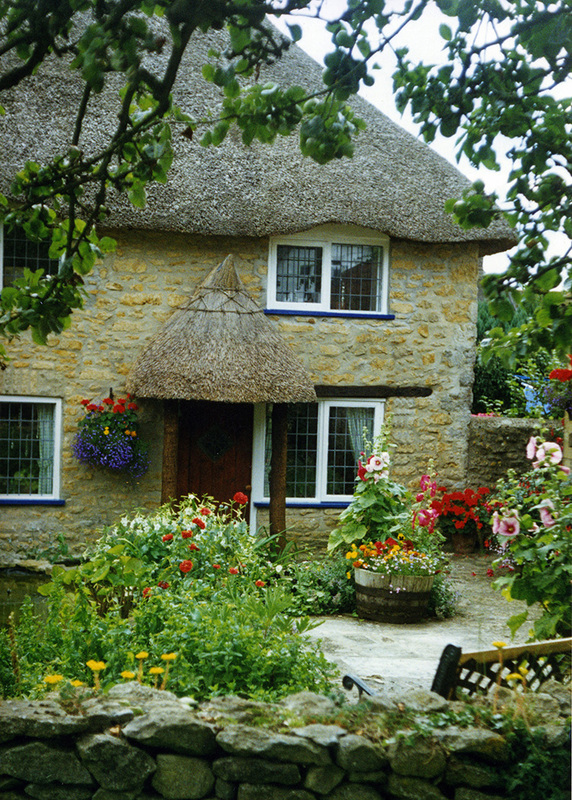 Then a normal thatched porch is often not feasible… With a typical door width of 3 feet (900mm); at least the same amount of space is needed; between the top of the door frame and the bottom of any window, to accommodate a thatched porch. This allows for a thatch at 45 degrees; which is the bare minimum, for a thatched roof pitch. Just under… The two neat porches on the left, at North Bovey in Devon; just sit comfortably under the eaves… The recent rain has shown up the dry and wet areas of the porches. 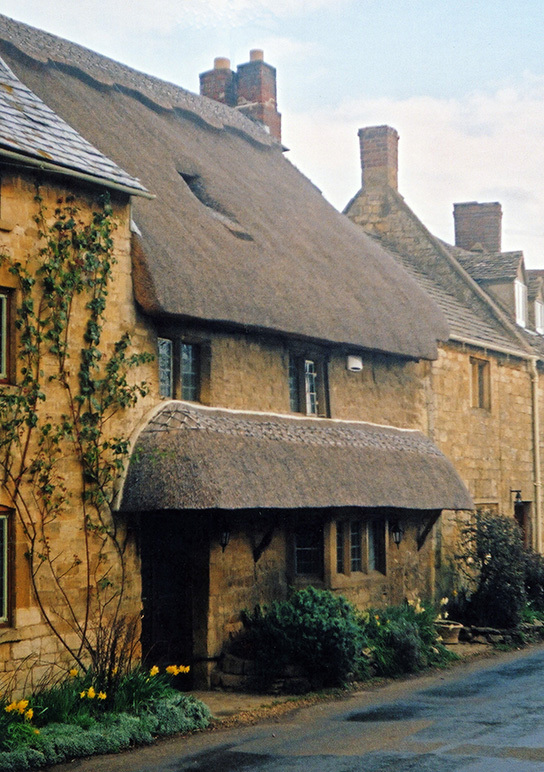 Where these two join, will wear the fastest… A thatcher has also fitted in the ridge, on the right, just under the windows, on a wide example, at Broad Campden in Gloucestershire. What has to be remembered, when working on these structures, is the amount of extra water the roof will carry, from the main thatch. This tends to wear out a small section. Mainly in a line under the eaves of the main roof, where all the dripping takes place… This worn strip under the drip line, can be repaired or rethatched over time. A porch ridge also tends to suffer. Here help can come from some lead sheeting… A thin strip of this sheeting can be placed carefully over the ridge, on the drip line. The amount need not be great. And is hardly noticeable, if fixed under any wire netting on the ridge. Due to all the extra water, the thatcher will need to ensure That any spars in the ridge, under the drip line, should be very much uphill. Water reed is not always suitable for these small sized features. The length of this material being the problem… The gable or hipped ends require the material to turn; often in a very small space. So on a water reed job, it is quite proper to use another material to cover any porches. Gable ends… From the left. A turning gabled porch, at Cropthorne in Worcestershire. And a boarded gable, at Eaton in Cheshire. It is good practice for the ridge on any porch to follow that on the main roof. 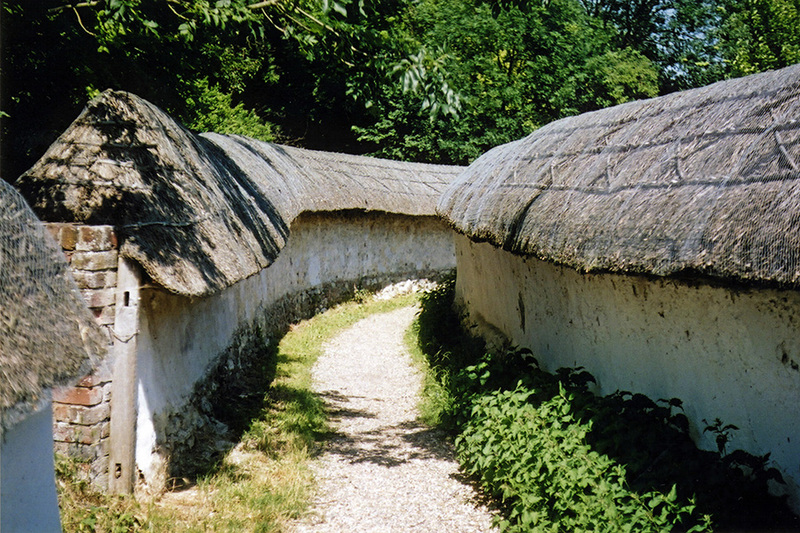 Not a feature widely found these days… But in areas where good building stone was hard to come by; thatch was once widely used to protect walls, of cob and clay. 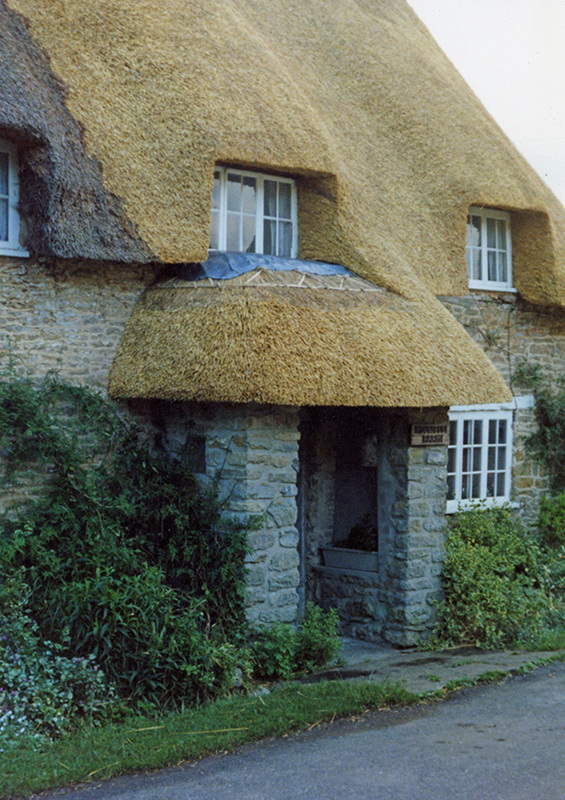 This type of thatching goes back a long way. In around 1320, at the Archbishop of Canterbury’s Thames- side palace, at Lambeth,‘six perches of wall in the great garden’, were repaired and thatched with reeds. 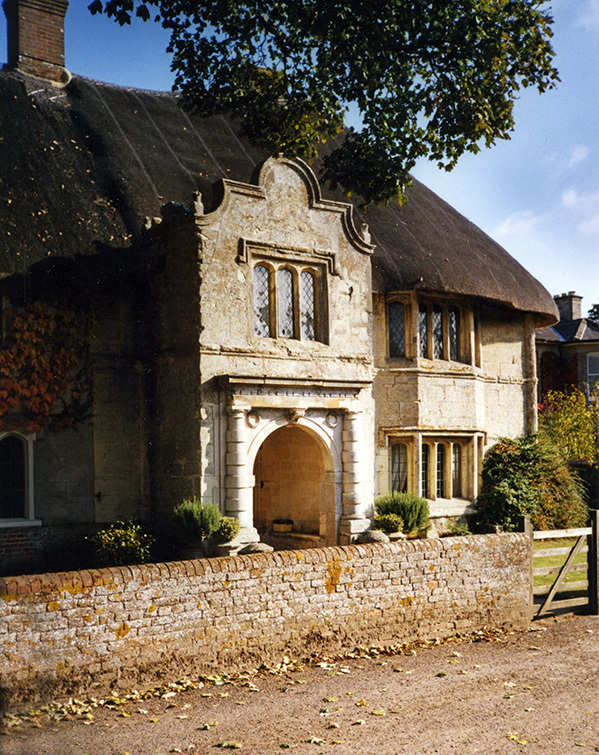 The next century saw similar features, at nearby Walworth Manor. Here fields were noted, as being surrounded by ‘earth walls thatched with reeds’…, in 1452. 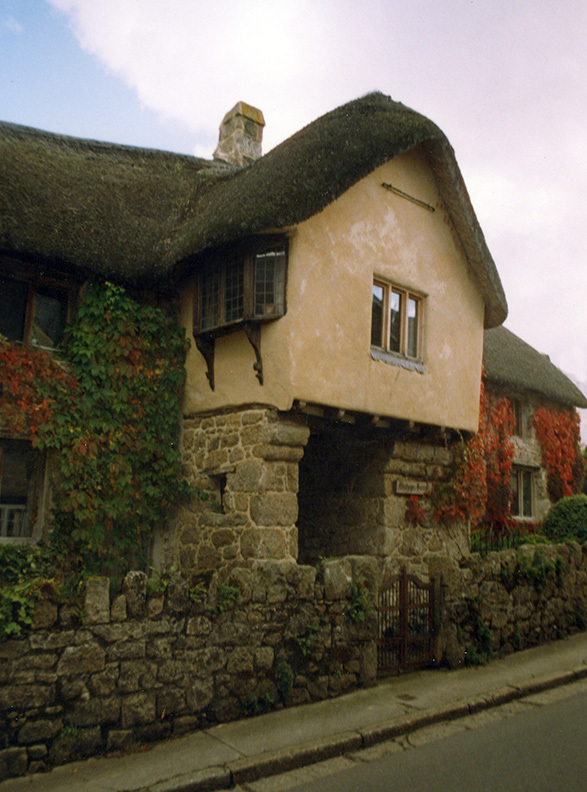 A thatched wall needs to be topped with a suitable timber frame. 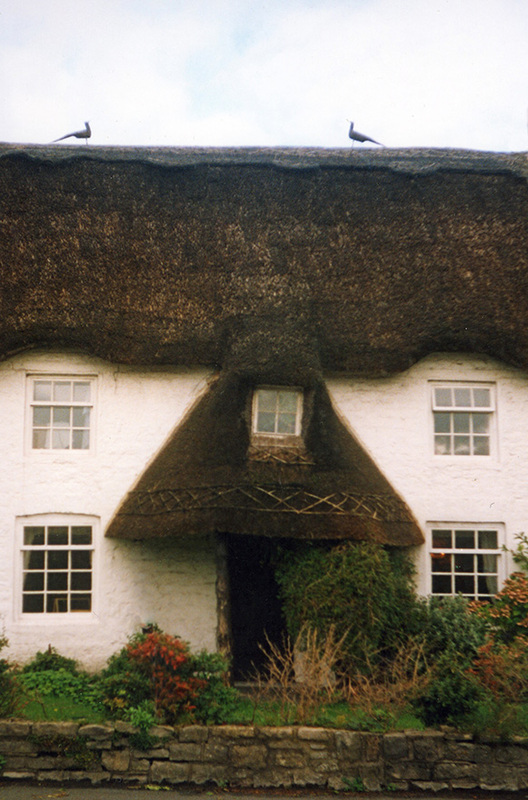 In effect a miniature roof… To this, is fixed some normal coatwork; but consisting of just one or two full courses of thatch. A regular ridge then completes the work… For their size there is a great deal of labour involved. 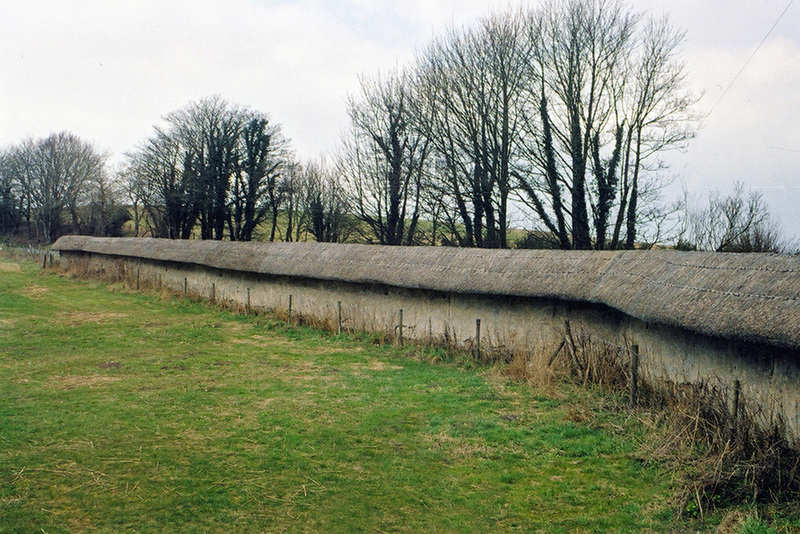 Reridging can cost the same as a regular thatch, of the same length. This can seem rather expensive for a tiny width of roof… But these walls can look very attractive. On and on… A garden wall, at Thruxton in Hampshire. 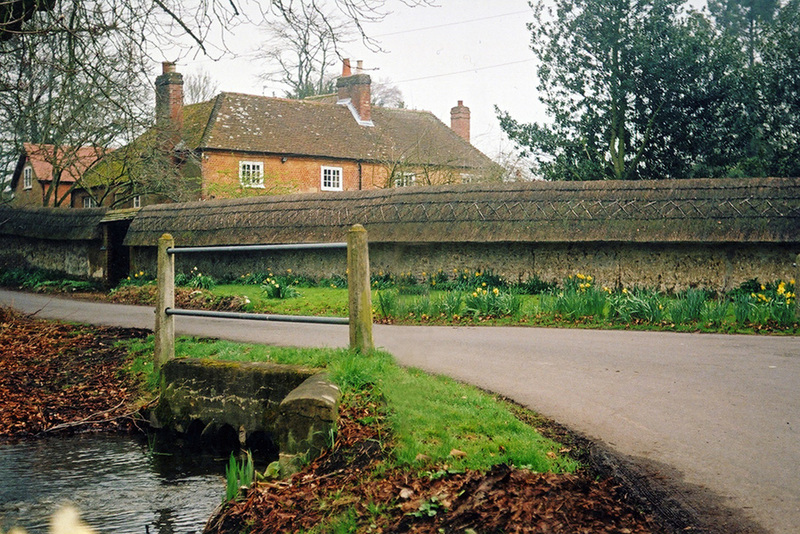 And a field wall, that really does go on and on… At Fyfield in Wiltshire.